As many of you know, pizza is a major food group – and always has been – for Ric. Spring 2013 at Dar Poeta. When I met Ric in 1984, I thought pizza was a once-in-awhile treat, something eaten at Pizza Hut, for a child’s birthday party, or all-too-often pizza at my house was a frozen one from Totino’s consumed as Sunday night supper. Marrying Ric changed my ways. I don’t always make the bed in the morning, especially if one of the cats is sleeping on it, and now I know that pizza is nature’s most perfect food, meant to be consumed at least weekly. 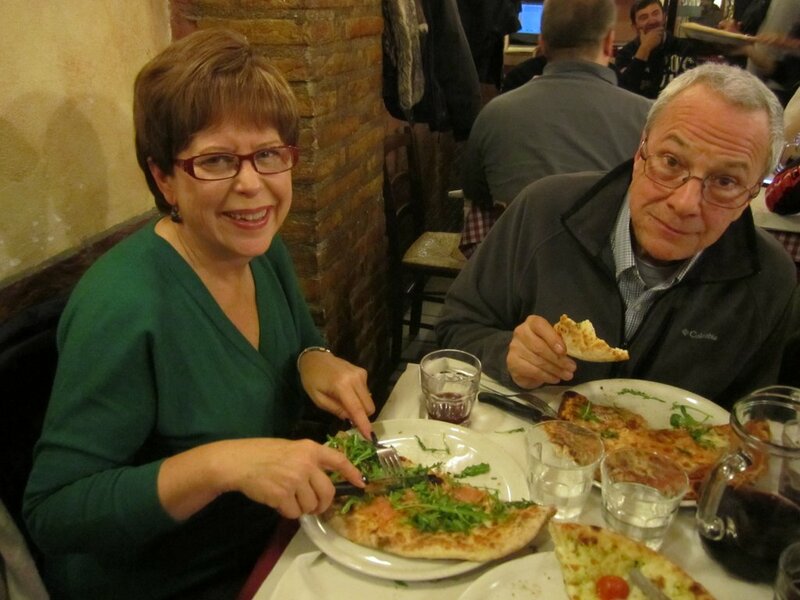 Moving to Italy added a layer of adventure and charm to our pizza eating. As we eat at least 52 pizzas a year, I thought documenting the journey a worthy endeavor both for us (“Where did we eat last weekend?”) and for those who dream of eating pizza all over Italy. I hope you will join the journey and click on over to my newest blog, Our Weekly Pizza. How in the world do you stay thin with all of this delicious food! Hahahaha! I would not say “thin” but we keep “fat” at bay with walking. I do about 12,000 steps a day on average, about an hour and 20 minutes just to and from work . All of our errands are done on foot, too. We also hit the gym three times a week when not traveling. Not having a car has been very healthy for us! Love pizza and love the tram in Rome. Did you know that there used to be two of them that circled the city one going each way.